Aron Johannsson played his youth international soccer for Iceland. Born in the U.S,, Johannsson switched his international registration and joined the USMNT in 2013. Once the change in international registration became official on Aug 13, 2013, USMNT coach Jurgen Klinsmann used Johannsson in a friendly the next day. Johannsson was well known in USMNT circles, spending the 2007-08 school year in residency training with the USA at the US Soccer Developmental Academy in Bradenton, FL. At club level, Johannsson played in the youth squads for several Iceland clubs before making the first team with Fjolnir in Iceland's second division (the 1. deild karla) in 2008. He joined AGF Aarhus in Denmark's topflight in 2010. In Jan 2013, he signed with AZ Alkmaar in the Netherlands, partnering with USMNT striker Jozy Altidore and filling the principle striker role when Altidore left for the Premier League at the end of the season. Johannsson was quick to make his mark with AZ, winning a starting job in his first full season and scoring goals. In August 2015, Johannsson transferred to Werder Bremen in the Bundesliga. 2015: Started against Denmark on Mar 25 and scored. Started against the Netherlands on Jun 5 and against Germany on Jun 10. Started against Haiti in the Gold Cup on Jul 10 and subbed on against Panama in the Group A finale on Jul 13. 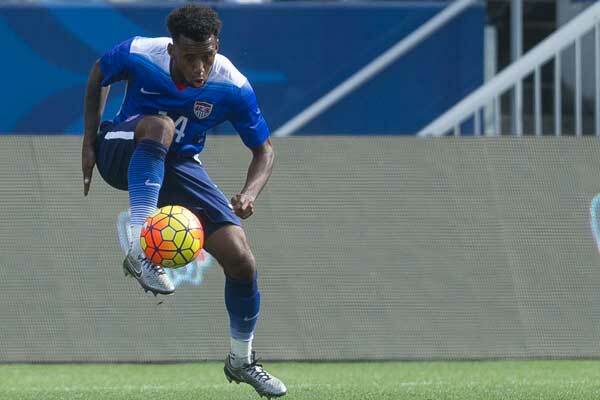 Started the Gold Cup quarterfinal against Cuba on Jul 18 and scored. Started the Gold Cup semifinal against Jamaica on Jul 22 and against Panama in the 3rd-place game on Jul 25. Subbed on against Peru on Sep 4 and Brazil on Sep 8. 2014: Named to the final World Cup roster. Started against Azerbaijan on May 28th and scored. Subbed on for the injured Jozy Altidore in the first-half of the World Cup Group G opener against Ghana on June 16th. 2013: Officially switched international registration from Iceland to the USA on Aug 13. Won his first cap on Aug 14 against Bosnia & Herzegovina. Due to injury, Johannsson missed a call up to Iceland's squad for a World Cup qualifier that would've potentially cap-tied him to Iceland the previous October. Johannsson became officially cap-tied to the USA in his next game for the USMNT, a World Cup Qualifier against Costa Rica on Sep 6 when he subbed on in the 90th minute. Started against Jamaica on Oct 11. Subbed on against Panama on Oct 15 and scored. Subbed on against Scotland on Nov 15 and started against Austria on Nov 19. 2017-18: Missed time with injury, finishing 11th in the Bundesliga with Werder Bremen. 2016-17: 8th in the table with Werder Bremen. 2015-16: Transferred to Werder Bremen in the Bundesliga days before the start of the season. Missed most of the season due to injury. 2014-15: Part of an AZ team that finished 3rd in the Eredivisie. Scored 9 goals in 21 games. 2013-14: A regular with AZ, playing in 32 games and scoring two goals in the Europa League. AZ made the Eredivisie Europa League playoff by finishing 8th but lost in the finals to Groningen. 2012-13: Played in 18 games with AGF Aarhus scoring 14 times and got his first experience at European level with two appearances in the Europa League qualifying round. Joined AZ on Jan 29, 2013 and played in 5 games scoring 3 goals. AZ finished 10th, but won the KNVB Beker domestic cup competition and qualified for the Europa League. 2011-12: Played in 30 games with AGF Aarhus scoring 7 goals. AGF finished 5th and qualified for the Europa League. 2010-11: Signed with AGF Aarhus in Denmark. 2010: Playing in a higher division with Fjolnir, made 18 appearances and scored 12 times. 2009: Played 16 times for Fjolnir, scoring a goal. 2008: Played in three games with Fjolnir, a lower division Icelandic club.